This weekend I had a very detailed plan of things I wanted to do. I didn't do any of them. In the end my weekend was turned inside out and I really can't complain because it was excellent. On Saturday I was going to go to the park to read in the morning, maybe drink some iced tea and go for a stroll. After that I was going to go to the market and buy some basic ingredients for a great cold pasta, then watch a movie, have tea and cake, and then the day would be over and movie night with the kids would begin. What I actually did was: turn my house into a clothing bazaar complete with suitcases of merchandise spread out all over my livingroom for friends to rummage through and buy. Children (a small 5yr old and a baby! were in my apartment as well - although I do have to say they were extremely well behaved) were running around and "participating" by slobbering all over the place. The baby was too cute for words though, so he was forgiven. The boys were going to spend the entire day at a friend's house, making my house a haven for refined ladies and peace. That fell through - Jesus take the wheel! Thing 1, Thing 2 and a friend all came back home (they spent the morning in school), and wouldn't you know it, the party/bazaar/mahem/Chinese marketplace was still going strong. We had to run out and find some kind of lunch for everyone, make it, clean up, serve it, and OMG! what an adventure. After cleaning up and clearing everyone out (no small feat), we watched/slept through the movie, The Scarlet Pimpernel - the fun version from the 80's with Anthony Edwards and Jane Seymore. When I got up I felt refreshed and ready to: make dinner, clean up after dinner, make popcorn, clean up after popcorn, watch a movie with the kids and then finally, finally lay down in deep, sweet, sleep. Holy Santos! Despite all the hectic confusion and complete absence of sanity, it was a very fun day filled with laughter, shopping and good company. Sunday was going to be a day of gourmet cooking and relaxation, but the plans changed only slightly. 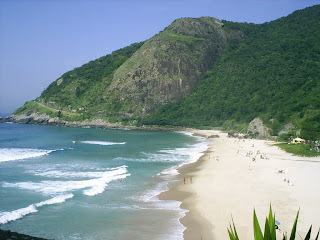 Instead we packed our caravan and headed for a paradisical beach. The boys and HRH went hiking and I sat at the beach, on a comfortable chair, reading and drinking ice cold Coke for hours until the boys came back. If I could only use one word to describe my time there it would be serenity. Pure serenity. 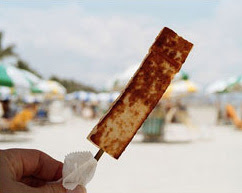 Then we all had a delish grilled cheese they only make on the beach here called queijo coalho. It grills up golden on the outside and is soft and almost bouncy on the inside. Yummy! We had ours coated in oregano first, then grilled with a creamy garlic sauce drizzled on top. Be still my heart! The guy told us the mayor wants to outlaw selling any type of food on a stick (this cheese is made and eaten on a stick - fun!)??!! It seems some morons eat it then - get this - throw it on the sand!!! Quel horreur! The sticks dirty up the beach and are dangerous. Seems to me that people need to be educated and told what to do (in certain beaches) as those of us who aren't useless pigs should not be penalized by having our precious cheesy goodness beach snack abruptly taken away from us! The boys were all ravenous so we made a traditional weekend meal of: huge contra-file steaks, rice with corn, french fries, fresh tomatoes and loads of Coke. The only thing missing were black beans. I made chipotle mayo and ketchup for dipping and enjoying. It was a fantastic feast and well deserved! Desert was chocolate ice-cream - of course, what else?